here is a gift bag and pillow box i have made using grosgrain ribbon and pearls from meiflower crafts.the papers are from trimcraft first edition and are called love letters. 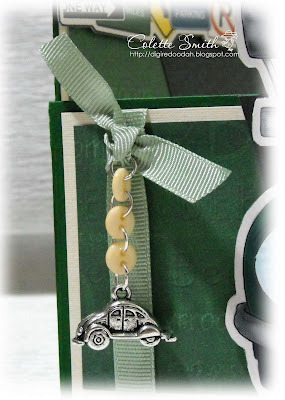 butterfly bead charms from MeiFlower. I have some jewellery pins in my stash, so I added some beads to one, along with a butterfly bead charm from Meiflower, looped the end of the pin, threaded a piece of cord through a buttonhole, the loop, the other buttonhole and then I tied the whole thing round the knot of my bow before fixing into place on my card. Every month I attend the Clipart Fairy workshop, and yesterday we made a total of eight cards, we used quite a few MeiFlower products on the cards and if you want to see what we did then check out my blog here. Everyone seemed to finish their cards quite quickly yesterday, except for a couple of us, who probably did a bit more talking than the rest of them.......didn't we Donna?!!! The stragglers got to have a look at Wendy's new Mica embossing masks and she decided to let us have a play with them. We all embossed a design onto white card and then were given some MeiFlower AB gems, ribbon and a ribbon slider and left to do our own thing. 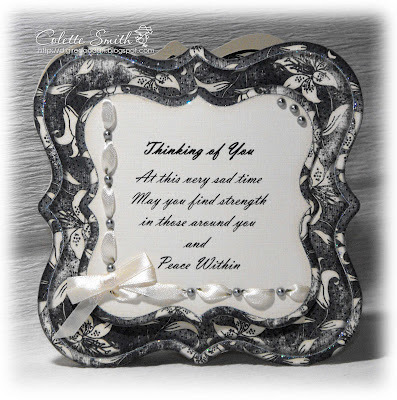 I glamour dusted the stems and leaves and then matted the embossed card onto black card, added the silver grey ribbon and slider across the front and an AB gem to the centre of each flower. The whole thing was then mounted onto a square white card base. I will add a sentiment tag once I know what it will be used for. It was so simple to make and looks really pretty in real life. A charming bow.... or three! 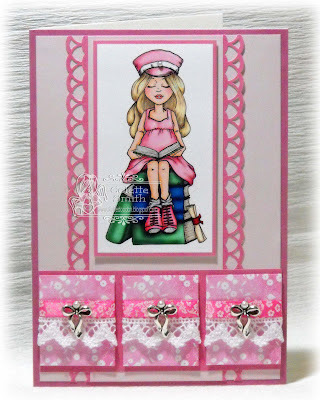 Although pink is not my favourite colour, I have produced a very pink card this time around, I love the floral ribbons from Mei and wanted to use one on this card, so the whole colour scheme was chosen to match the ribbon. and then covered the holes with stick on pearls. Sorry for the really bad pun, I just couldn't help myself LOL! The title has probably given you a bit of a clue but my card for today is for a Yoga loving buddy. 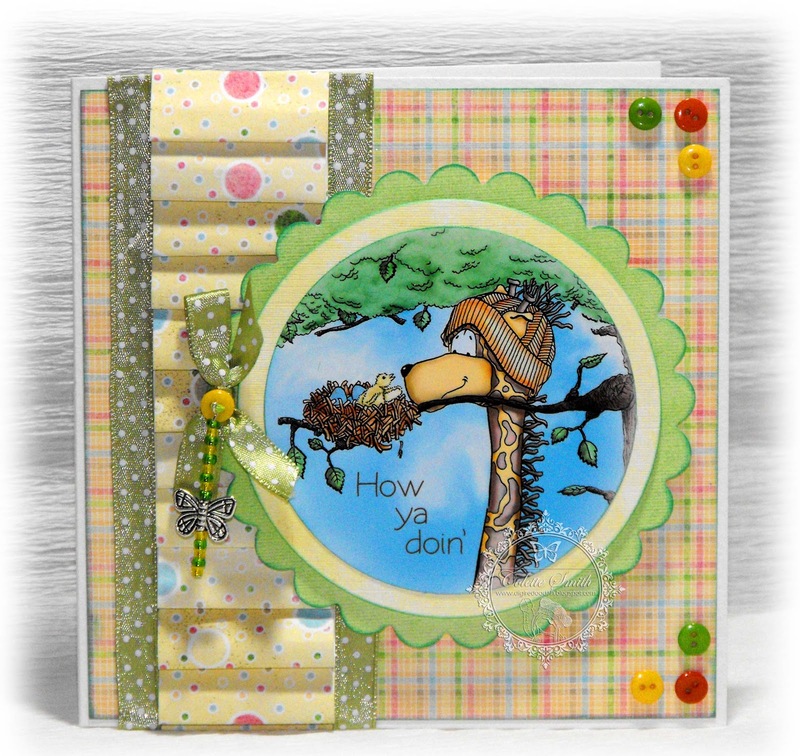 I used black card for the base and mats as I just love how it makes the zingy colours pop! I also inked around the edges of the die cut flowers before shaping them and layering them up. I added tiny little gems to the tips of the spikes on the flower centre and a tiny sequin blossom and gem to the centre of the flower, I also added a little gem to the charm. Hope all the mums out there are enjoying your day and being spoiled rotten by the family. 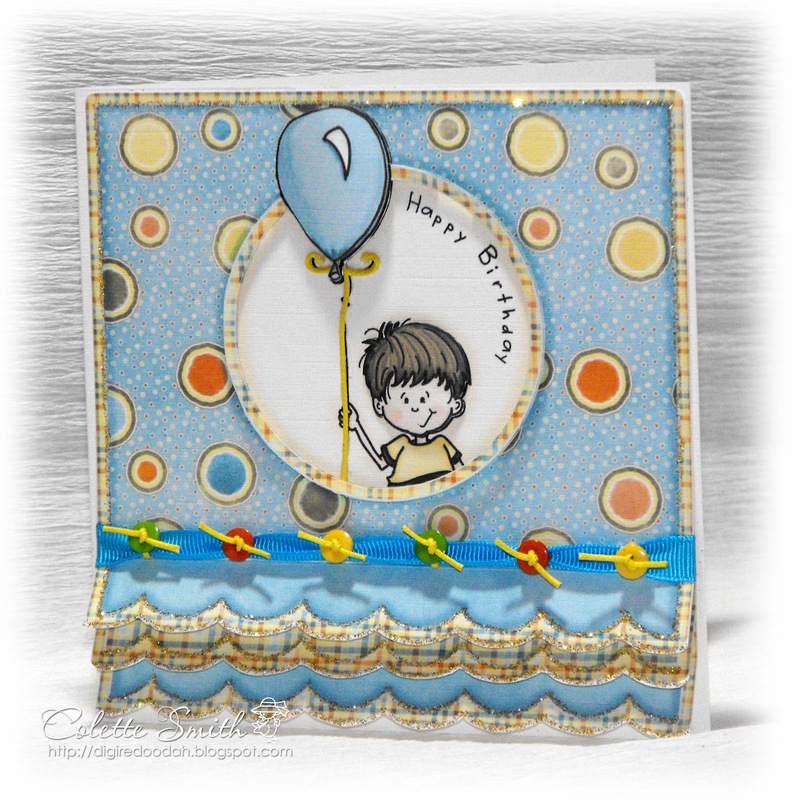 I've got a birthday card to show you today using the Kick Frill Balloon Boy Kit from the Clipart Fairy. I used the Ready to Print version, but printed the main topper out twice and used parts of it to add an extra frill and layer up the design a bit more. 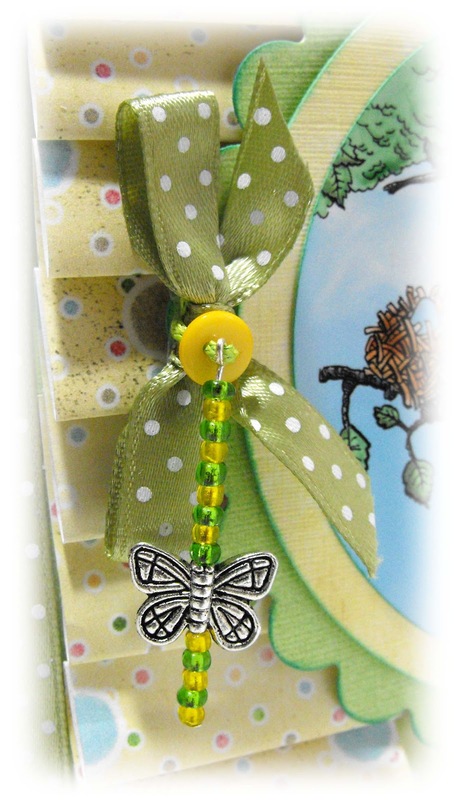 I added Grosgrain Ribbon across the front and then tied tiny buttons around the ribbon with yellow cord. I also applied a thin line of tacky glue over the printed balloon string and stuck the cord to that too. Ribbon, Cord and Buttons are all from MeiFlower. Today's card uses ribbon, buttons and a charm from MeiFlower. Image Teddy Bo and Co - coloured in Photoshop - I added go faster stripes! I found some split rings in my stash and used them to join some of the buttons together, dangled the card charm at the bottom and used another to loop onto the ribbon as I was tying the knot to hold it into place. Although I have made this as a birthday card, I thought it would also be really good for a congratulations on passing your driving test card, you could even put a photo of the recipient in the drivers license. .....but in this case it's actually four's. MeiFlower do some fabulous chipboard baby embellishments, four in a pack in either pink or blue, and two different pack designs. 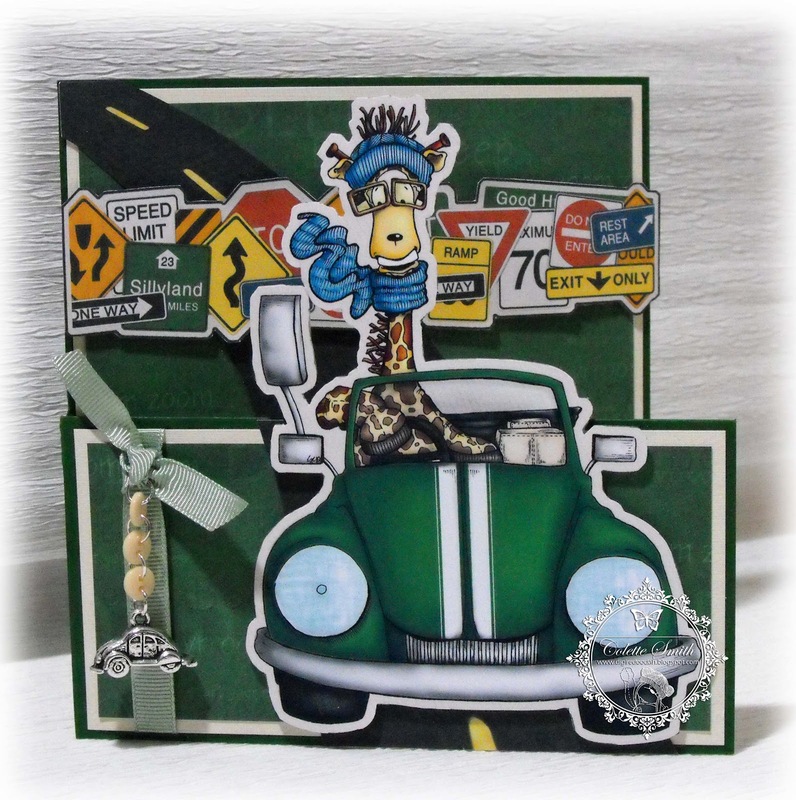 I have used three toppers from one of the packs on this card. 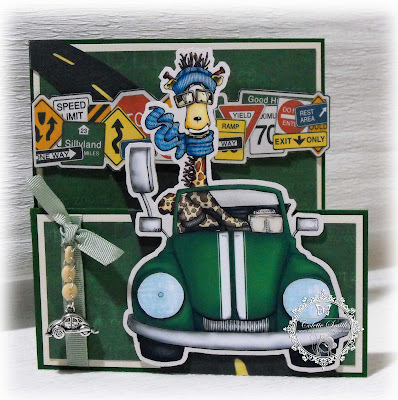 This was another one of those cards that was quick to put together, brilliant for when time is short. 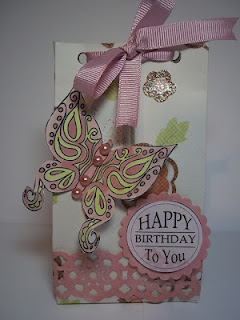 Today I have a baby girl card to show you made using Meiflowers Chipboard shapes. 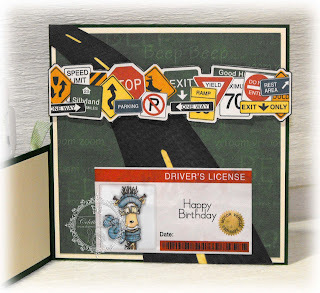 These are brilliant to have in your stash for whenever you need to put a quick card together. 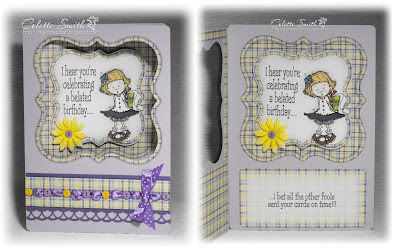 Each pack contains four embellishments and there are two different styles in both girl and boy. I know that the buttons and chipboard shapes are not showing in the store yet, if you see MeiiFlower at any of the craft shows they attend up and down the country then you can pick them up from there, otherwise you need to email Mei to order them. Check back tomorrow for a card using one of the boy packs. Now I know that most of us buy Mei's gems and pearls to add to our cards, but today I am going to show you one of the ways that my friend Donna uses them. 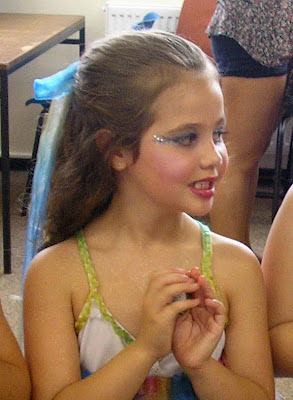 Donna's seven year old daughter Chloe is quite an accomplished dancer, and a real diva by all Donna's tales, she loves to be sparkled up whenever she is in a show and Donna uses MeiFlower gems around her eyes for that extra touch of glamour. Here are a few pics Donna sent me of the adorable Chloe and her sparkly eyes. Doesn't she look gorgeous and quite the little star, and a completely different way of using the stick on gems. 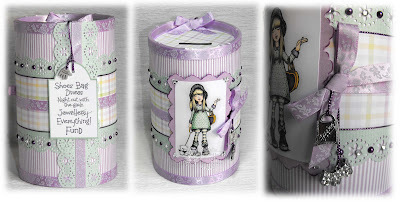 Today I have a money box to show you which was made from an empty gravy granule tub. 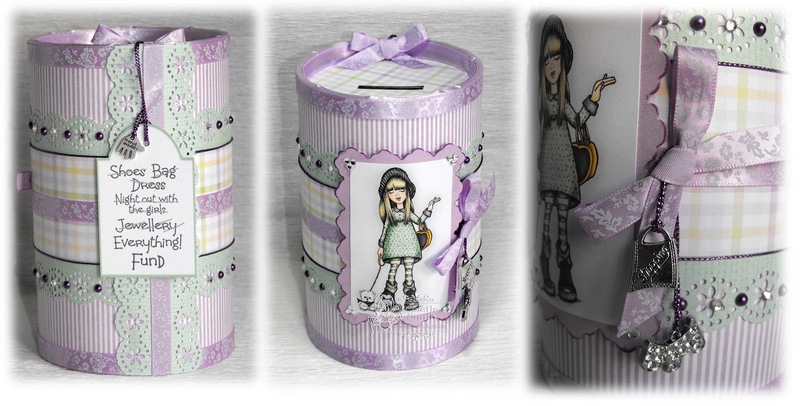 I turned it over so that the lid was underneath, cut a slot in the top (bottom) and then covered it in papers from the Clipart Fairy. I punched out a fancy border for around the middle and another to cover where the papers, ribbons etc, joined. I used double sided tape to attach ribbon over the top edge of the tub and around the top and bottom. I added gems, pearls and charms to finish it off. I love the way it turned out, and can't wait to get to the end of my next tub of gravy granules to make another LOL! 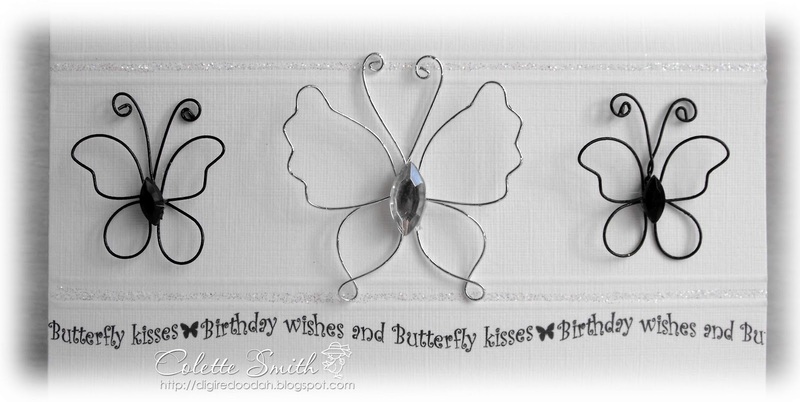 I have made these 4 clean and simple cards using pearls and gems [flower centres] from meiflower crafts,the flowers are cut with a spellbinders die. 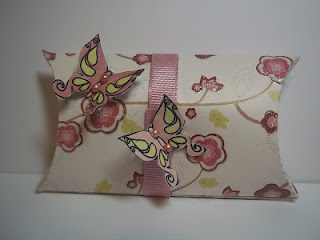 I have made this card using the clipartfairy's graphics and papers , meiflowers ribbon ,flowers and pearls and the swirls are a dienamics dies.The matching box is made using a sizzix pillow box die. I found these gorgeous butterflies on Mei's stall at the craft show Saturday and just couldn't resist, so had to grab myself a couple of packs (the photo doesn't do them justice, the stone in the centre sparkles beautifully and the wings are made from shiny metallic wires which also sparkle when they catch the light). You may have noticed one already on yesterday's card, but this time around I have used three and they are the main focus of the design. 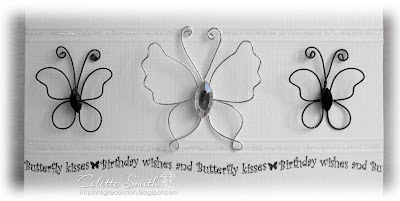 For this card I made a square card blank from a piece of A4 card, printing the wording on before cutting and folding. 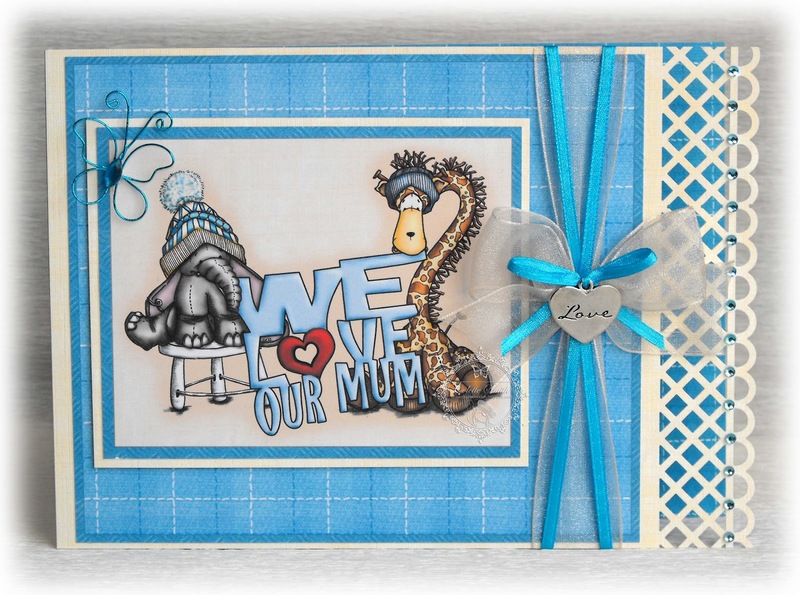 I embossed lines across the front using my Hougie board, then drew a line between the embossed sections with my quickie glue pen and added glamour dust. One large and two small butterflies were attached with dollops of tacky glue and hey presto! there you have it. Simple and sweet. The butterflies come in two sizes, the small ones are five in a pack and contain, 1 each of five colours, turquoise, black, silver, pink and red. The larger ones have four in a pack and have 1 each of cerise, turquoise, silver and black. 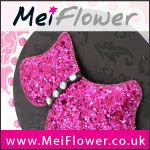 I'm don't think they are on the website yet, but if you fancy some just email Mei and she will get it sorted for you. Here is a panel card i have made using a card blank from every crafts a pound. 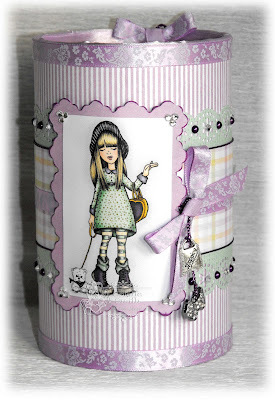 I used pearls , white grosgrain and blue organza ribbon and a pearl buckle from meiflower crafts .The papers are rom the clipartfairy's digi paper pack called yummy and the stamp is from kanban urban belles. 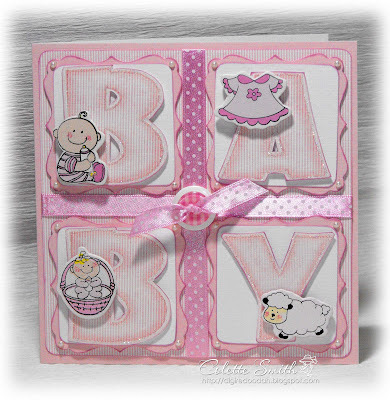 Just a quick post from me to show you this cute New Baby card I've made. The ribbon and flowers are from Meiflower Crafts. 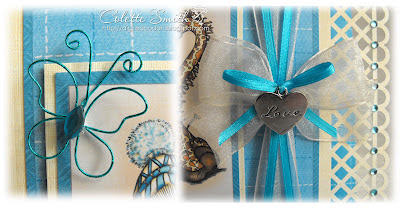 My card today is a landscape A5 card Mother's Day Card, it uses one of my favourite colours - blue - (turquoise being my absolute favourite shade of blue) - a beautiful butterfly, ribbons, gems and a charm all from MeiFlower. Close up of the beautiful butterfly, charm and ribbons. 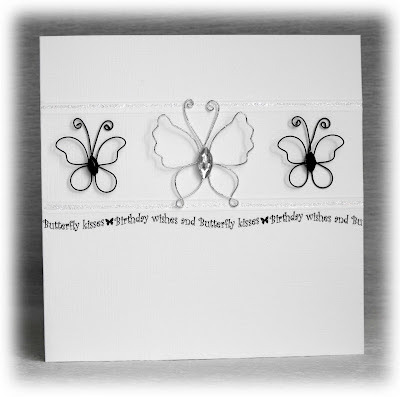 I'll be back Wednesday with another card to show you using more of the butterflies. 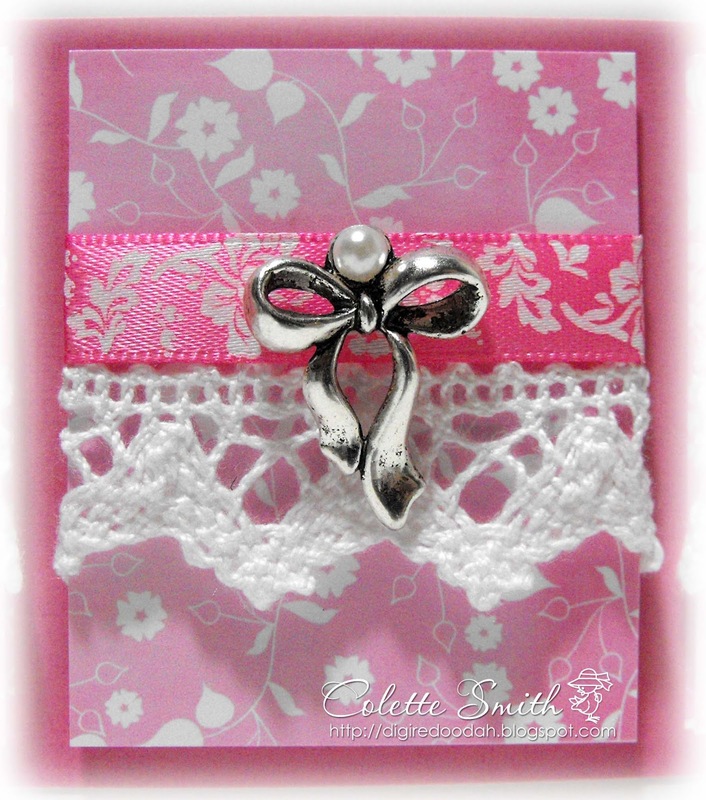 Fairy card using pearls and ribbons from meiflower. 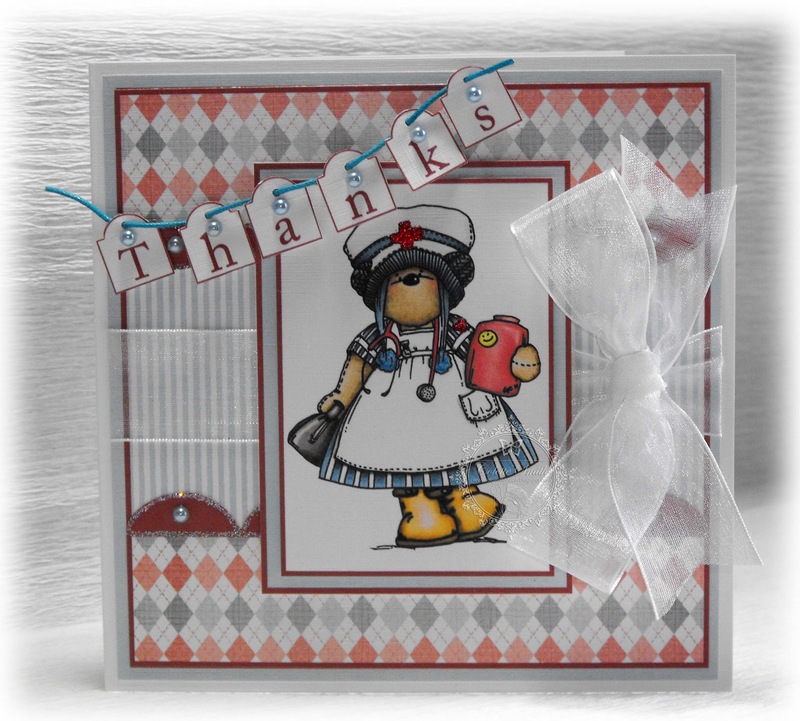 Here is an oval easel card i have made using . ribbon and pearls are from meiflower crafts. 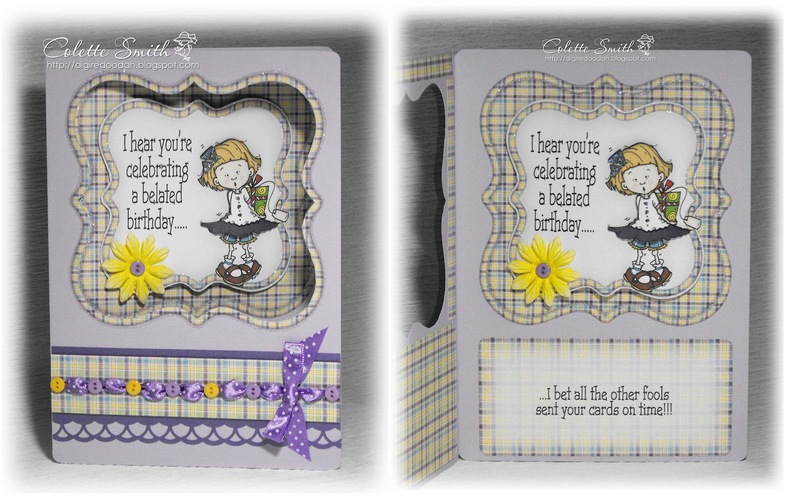 Here are a couple of cards made using the Clipart Fairy Shaper CD, which are both decorated with MeiFlower ribbon, pearls and buttons. I punched holes into the topper and threaded ribbon through, then added a gorgeous silver stick on pearl in between each loop. Ribbon and silver pearls - MeiFlower. 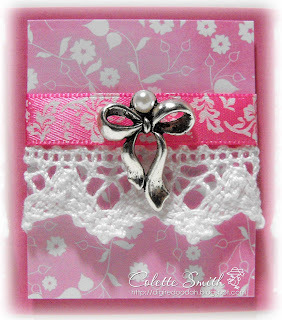 I used the same technique with the ribbon on this card, but added a little bitty button between each loop. 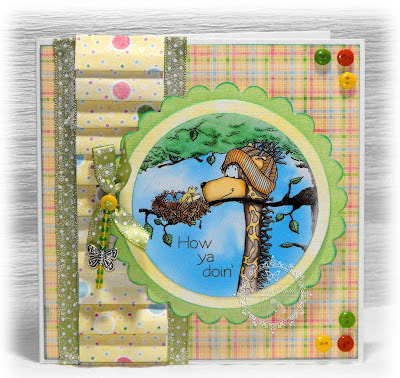 If you want any more info about how I made the cards check out my blog. Peach organza roses,embossed ribbon threaded through a marianne d die cut and white organza ribbon.The bouquet is made from slower soft and the papers are shabby vintage from bearly mine. My name is Colette and I'm a Blingaholic LOL!, like most of us I can't resist something sparkly and when I saw this freebie sentiment over at Create with TLC I knew it was meant for me. I have been eager to use it since I downloaded it and yesterday managed to find a few spare hours so decided I would go for it. 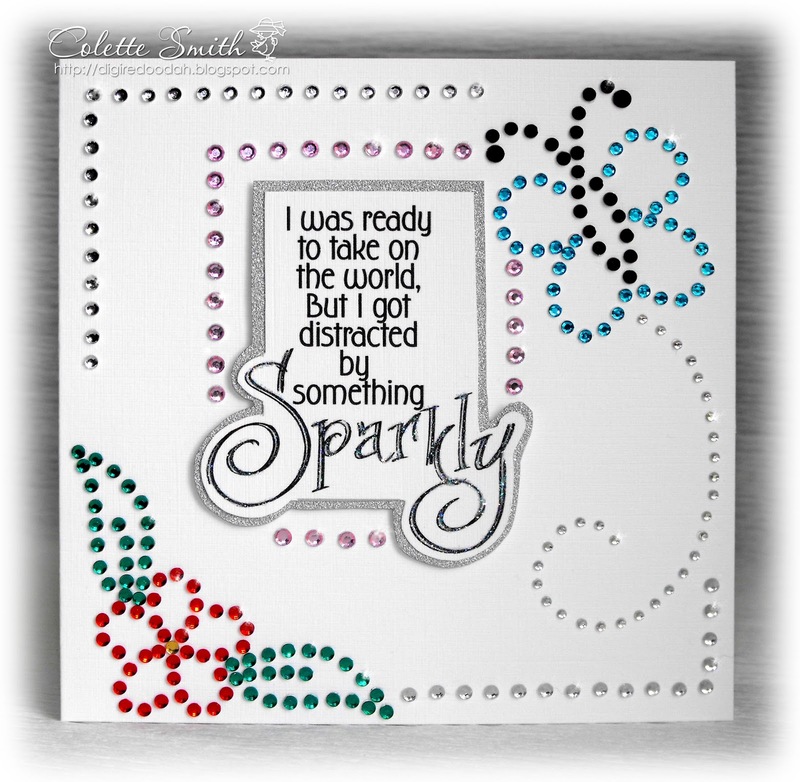 I wasn't sure what sparkly things to add to my card, so I had a hunt through my bling collection, which took me ages as I was constantly being distracted by sparkly things LOL!, but eventually settled on the idea of adding images around the sentiment made wholly from self adhesive gems. 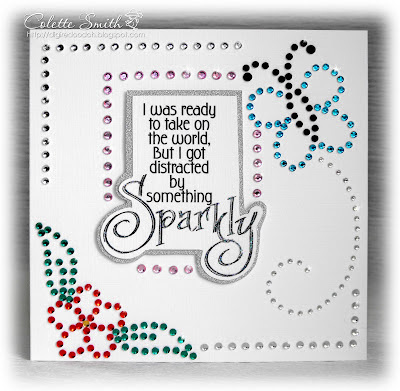 Out came my Bazzill Jewel Templates and I set to work, and this is what I ended up with. It looks brilliantly sparkly in real life, but unfortunately the camera doesn't capture it, but I will be seeing Mei at the Sincerely Yours craft show today, so I am going to give it to her as a sample. If you see her at any of the craft shows that they attend around the country, go and check out the sparkliness for yourself. 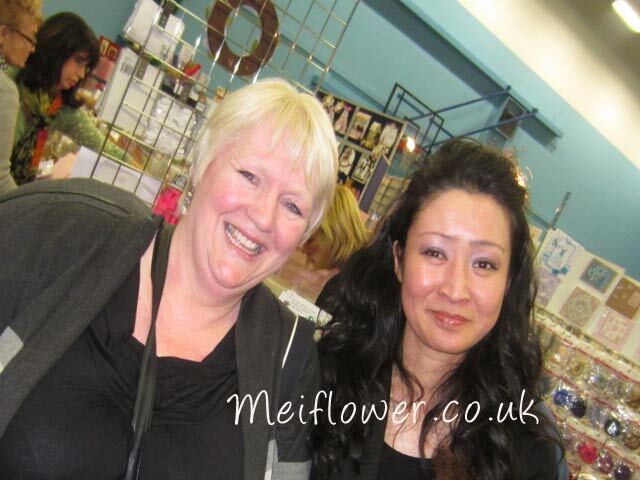 This is Mei here, just attached a pic of me and Colette at Sincerely Yours Crafts show at Leigh. Thank you Colette for the bling, bling card. Just what I need to brighten up a dreary, rainy day! 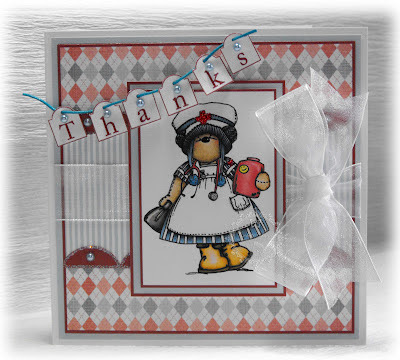 I made this card for a friend who wanted a card to say thanks to the nurses who have been looking after her husband during his treatment. I printed each letter of the word thanks onto it's own little tag, cut around and punched a hole into each one and then arranged them on a piece of co-ordinating waxed cord from MeiFlower. I draped the tags across the card and once happy with the position stuck each one in place with a small foam pad. I thought it was a slightly different way of adding a sentiment to your card. White organza Ribbon, blue pearls and blue cord - MeiFlower. I'm off to the Sincerely Yours craft show at Leigh tomorrow, with a group of friends and will be able to catch up with Mei who will be there too, but working very hard!